The Merck Veterinary Manual defines canine separation anxiety as the "inability of the pet to find comfort when separated from family members." In other words, when left home alone, dogs with separation anxiety lose it. The result might be destruction throughout the house, nonstop barking or indoor urination or defecation. Helping a dog overcome separation anxiety takes some effort, and perhaps professional help, but you can get to the point where it's safe to leave your dog alone. While any dog might exhibit separation anxiety, the behavior is more common in dogs who have been rehomed, or adopted from a pound or foster situation. These canines already have lost the person most important to them. Now that you are that person, they're afraid when you leave you won't return. Separation anxiety can continue even when you're back in the house. Most dogs like to be in the vicinity of their owners, but dogs with separation anxiety don't want you out of their sight for a minute. If possible, use a video camera to record your dog's behavior for your vet or a veterinary therapist. This allows the professionals to see the behavior your dog displays, as well as the triggering incidents. The latter might include putting on your shoes or coat, or taking out your keys. Program the camera to record the behavior when you return as well. The vet or therapist might advise you to change your behavior to help your pet. Your vet might prescribe Clomicalm, or clomipramine hydrochloride. This drug increases the level of serotonin in your dog's brain. Serotonin, a neurotransmitter, works as a mood regulator, and can decrease anxiety in your pet. Your vet might also prescribe various antidepressants or anti-anxiety drugs. Most dogs require medication in conjunction with behavioral therapy. 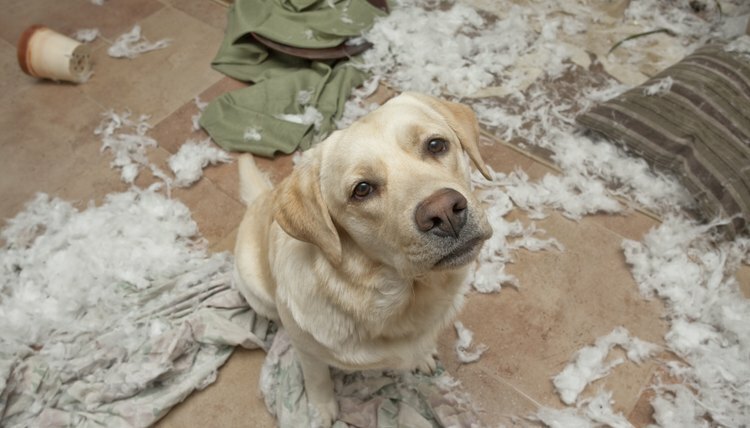 Use desensitization therapy to quell your dog's separation anxiety. It can take time, but eventually he won't realize that you're leaving and won't particularly care. The phrase, "A tired dog is a good dog," holds true for many cases of separation anxiety. If possible, take your dog for a long walk before leaving the house. Before you do leave, give him a treat to distract him from your departure. A Kong toy stuffed with peanut butter or a similar item works well. When you leave, do just that. Don't say goodbye or pay attention to him. Vary your routine, so your dog can't tell exactly when you're heading out the door. That can include putting on your shoes well before exiting or taking out your car keys regularly when you have no intention of going anywhere. When you come home, don't greet your pet effusively. Walk into the house and pay no attention to him. What Would Cause a Dog To Attack? Do Dogs Turn Aggressive For No Reason? Can Blind Dogs Live Happy Lives?